The Society of Flight Test Engineers honored United States Air Force Test Pilot School technical director, David L. Vanhoy (MS ?88), with the 2012 Kelly Johnson Award for excellence and outstanding achievement in flight test engineering. It is a single, annual award that recognizes an individual for their substantial contributions to flight test and the society. 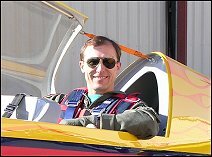 Vanhoy played a critical role in developing the NF-16D Variable Stability In-Flight Simulator Test Aircraft (VISTA) and was selected as the X-35 Flight Test Team Lead for the Air Force Flight Test Center. Vanhoy then became the Flight Chief of the 773rd Flight Test Squadron at Edwards Airforce Base, the second-ever civilian technical director of the school.